How are you guys doing? 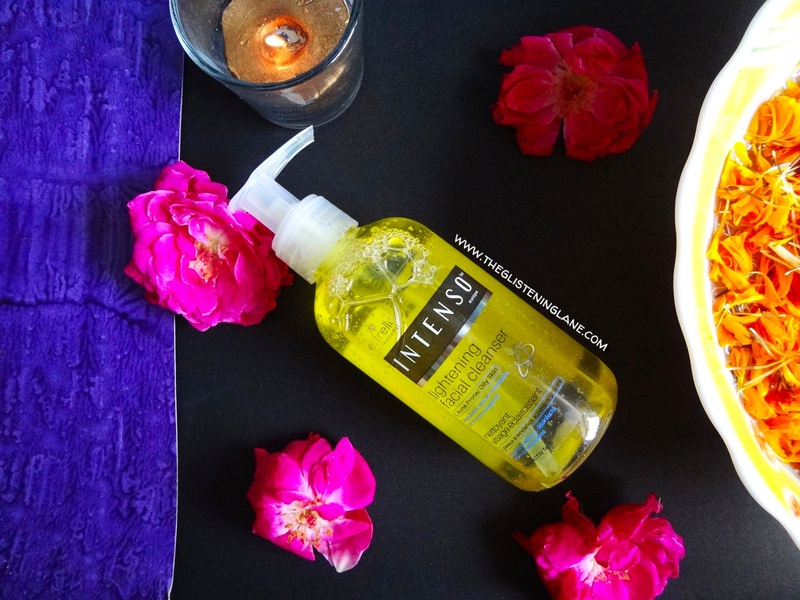 Today’s post is dedicated to a facial cleanser that’s meant exclusively for oily skin type. Now, we all know the basic rule of CTM & unless you hunt a cleanser that’s meant exactly for you, chances are that other skincare products might not provide your desired results. 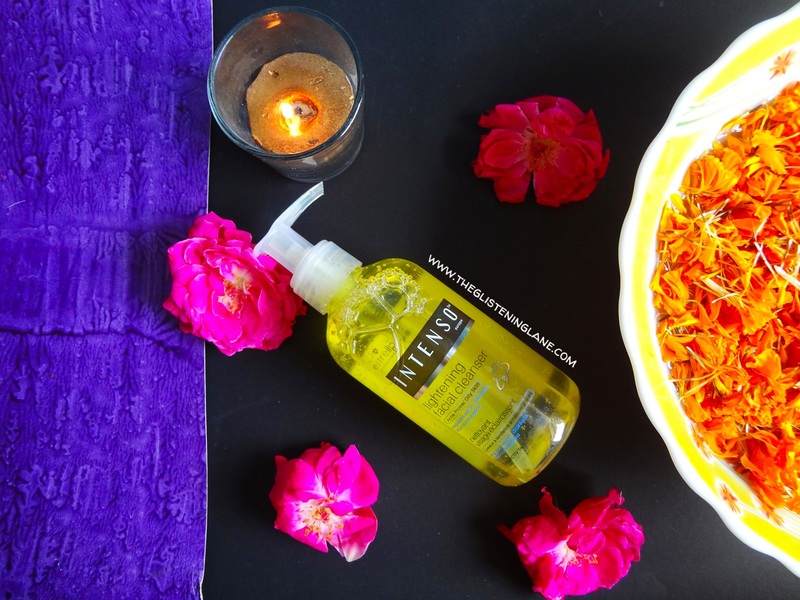 Oily skin comes with its strings attached & being acne prone is one such turbulence! I must have narrated this incident a gazillion times but yes, two years back I was stuck with severe acne and that gave me insight to seek for the cleanser that works well for me. And of course, we are talking drugstore currently. 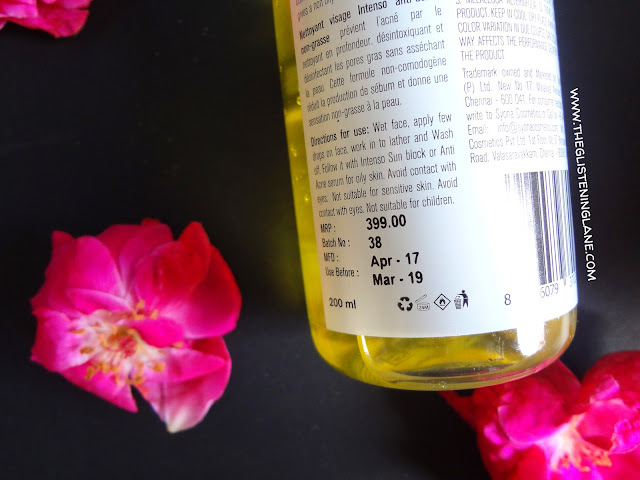 So without further adieu let me kill two birds with one stone & not just introduce you guys to the brand – ESTRELLA but also take you through my experience with their Intenso Lightening Cleanser. Let’s begin! ESTRELLA PROFESSIONAL - World Class Products, Made for Indian Skin. Intenso, the flagship premium brand of Estrella is powered by the Tri-LACTIV Tech that works on technologically superior yet safe and effective product architecture to deliver desired results. Intenso's professional product range is used across salons and spas by professionals to deliver complex and advanced solutions to clients. Highly recommended for post care, Intenso ranks as a top choice among salon goers looking for professional care for their skin. 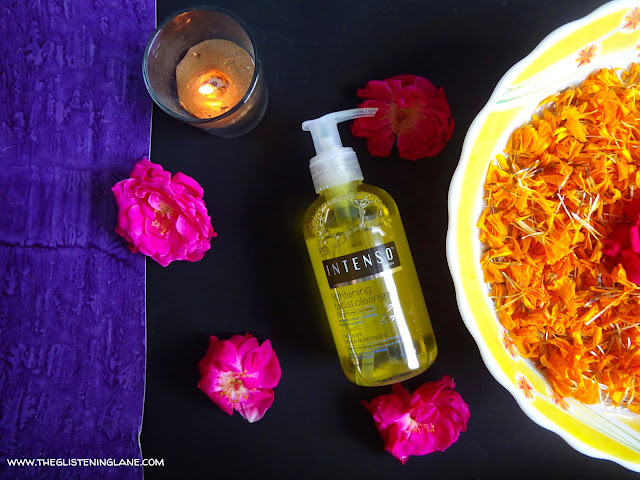 Intenso's wide product range offers complete care regimen including face washes, Day Creams, Anti-pigmentation creams, Night Creams, Skin Lightening exfoliators, balancing Toners and much more. Description: Intenso Anti Acne & Oil Free Facial Cleanser prevents acne by deep cleansing, de-toxifying and disinfecting oily pores without over-drying the skin. This non comedogenic formula controls sebum and gives a non oily feel to skin. Directions for Use: On wet face, apply few drops of it on face, work in to lather and finally wash off. Follow it with Intenso Sun block or Anti Acne Serum for oily skin. Avoid contact with eyes. Buy Online: You can purchase it directly from their official website by clicking HERE. It is also available on Amazon; direct link for purchase is HERE. Packaging: The Estrella Professional Intenso Lightening Facial Cleanser comes in plastic bottle which makes it lightweight to carry & travel friendly. The content can be taken out via pump dispenser attached and it not only caters convenience but saves the product from being wasted. Now before I start sharing my detailed experience with you guys, it’s better to first disclose my skin type & what type of products or cleansers in specific I prefer to use. My skin behaves differently in every weather and it ain’t tamed enough to fit into standard skin type category. 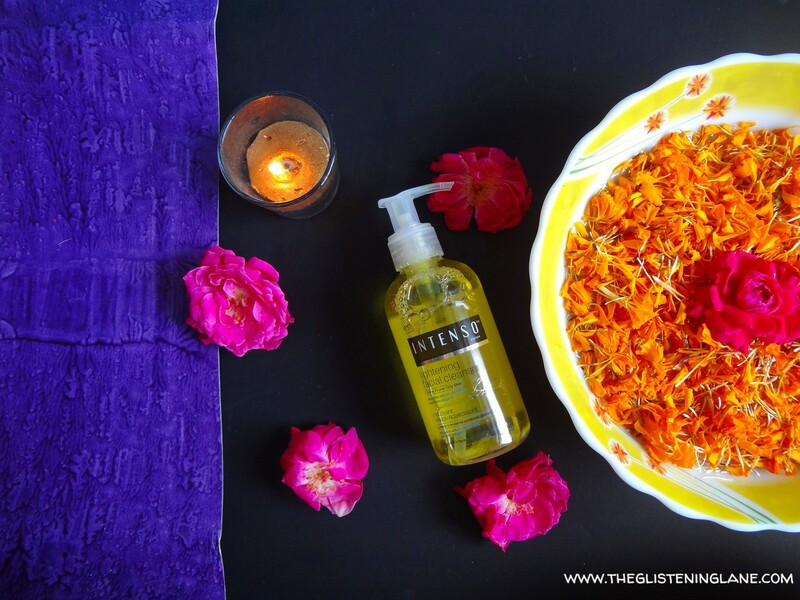 While it goes flaky within the winters, in summers and exclusively around monsoon, it rebelliously turns SUPER-OILY! Also, I tend to sweat a lot on my face & as soon as it comes in contact with dirt or bacteria, I start to acquire small red & itchy bumps which silently doze off if immediately treated. Therefore, my foremost need & expectation from a cleanser is that it does not hydrate my skin because I do wanna try gel based moisturizers and if I already see moisture endowed because of face wash, I am not gonna look at moisturization aspect. Similar is the case with facial masks, people do love that subtle moisture but I like sweat-free face post cleansing. Don’t be horrified about it because I’ve devoted night time especially for enriching my skin with nutrients & moisture, and for that I pretty much love my LOA Miracle Oil. Also, on days when I do wanna go for hydrating facial masks, I grab some of Innsifree Sheet Masks! Since that was a lot of blabbering, let’s start with the details on cleanser. When I un-boxed this cleanser, it seemed only decent & gave drugstore vibes and I wasn’t hyped up about using this. On my first trial, I detected how it foamed good and little product was only needed. Post wash, my face literally appeared squeaky clean, oil free & lightened. By squeaky clean I don’t mean it left my skin dry and stretchy, it was soft & supple but with no greasiness. Every possible trace of washable makeup was gone down the drain! This face-wash here consists of Salicylic Acid & in case I forgot to add the fact that I tend to still get acne (at the age of 23) then this is the best time to convey that! Other reason for getting acne remains usage of comedogenic products & this one is *hold-your-breath* Non – Comedogenic! 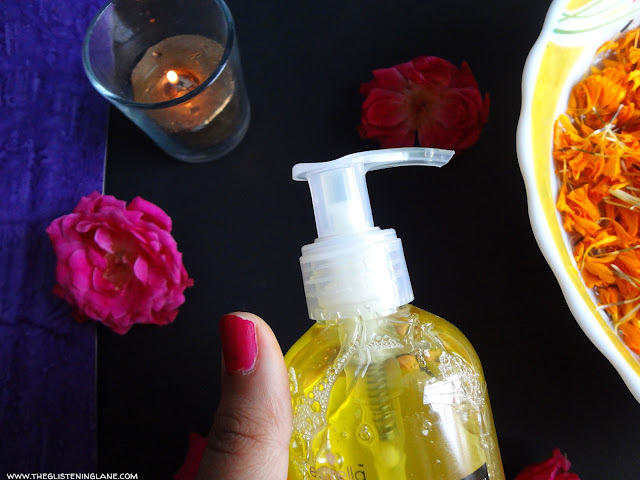 Also, it has a lemon citrusy fragrance which works great for morning cleansing. ▶Travel Friendly Packaging with Convenience of Pump Dispenser. ▶Contains Salicylic Acid which Helps in Keeping Acne at Bay! ▶It is also Non- Comedogenic. ▶Washes off Dirt, Sweat, Sebum & Makeup. DISCLAIMER: It is Best Suited for Oily Skin Type with Issues of Acne; Dry to Normal Skin Type People would might feel it to be Drying on their Skin! Nice and detailed review. Will look into this brand and see if there are any cleansers for my dry skin. Waoo sound good, you can check below website for more shopping..